This is a weekly feature in which I (and maybe you, too, readers) detail the various reasons for hating your ballpark. 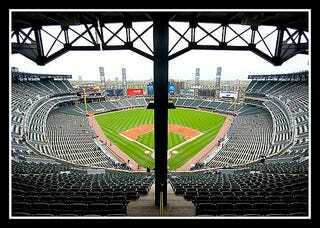 This week: The Chicago White Sox's U.S. Cellular Field. Hard Cell: U.S. Cellular Field is the hideous ransom paid to the White Sox after they spent the late 1980s threatening to hie themselves to St. Petersburg. This was deemed a fate too awful to imagine — the franchise had been in Chicago since 1901, after all — even though it's in the natural order of things for cranky 80-year-old nuisances to slink off to some godforsaken spot in South Florida where they can be safely ignored. In any event, the taxpayers gave the White Sox their lame Royals Stadium ripoff, the last ballpark built before the retro craze and certainly the last time anyone thought the Royals a franchise worth imitating. In fairness, the stadium did feature several design innovations, chief among them the decision to place the farthest reaches of the upper decks somewhere near Aurora. No one much liked the place, which is why it has been in a constant state of self-mutilation from the moment the Sox snipped the ribbon. A vast five-stage overhaul began in 2001, when the stadium was 10 — 10 — years old. The White Sox: baseball's cutters. Shining Armour: In 1989, as the White Sox mulled various stadium proposals, a Chicago architect named Philip Bess drew up plans for a ballpark in the spirit of what he called, in his book City Baseball Magic, "pragmatic idealism." The design of Armour Field was "governed by a concern that it be a genuinely urban building, constrained by its block, with an architectural presence, scale, and monumentality befitting its status as a public building," a true neighborhood ballpark. It was a wonderful proposal and looks even better today, after two decades of downtown baseball nostalgia palaces. "Camden Yards, Jacobs Field, and Pac-Bell are not 'neighborhood ballparks,' but rather 'downtown ballparks,'" he told one interviewer. "Many people in our culture have stopped thinking of cities as good and desirable places where people live as well as work, shop, and play. Instead, they think of cities as 'entertainment zones,' and of stadiums as 'anchors' for downtown entertainment zones. The goal has been to replace the tax revenues lost by the flight of middle class families from cities, to use public dollars to finance new ballparks in an effort to keep municipal services and governments afloat. But this seems to me a short-sighted solution. Better to make cities themselves livable again; and well designed smaller-scaled neighborhood ballparks can be a legitimate part of that strategy, and make money for team owners at the same time." What happened next was everything Bess had sought to avoid. New Comiskey was thrown up in 1991, a suburban stadium dropped into an urban setting, uprooting 250 households, disrupting the street system, turning the old Comiskey Park into a parking lot and more or less gutting the old neighborhood of Armour Square. It's not clear if the White Sox ever seriously considered Bess' proposal. My guess is Jerry Reinsdorf took one look at a rendering and laughed himself out onto 35th Street. Bess never really had a chance, anyway. As Charles C. Euchner has written, the architect's proposal would've removed the buffer zone — a park — between black Armour Square and white Bridgeport, a politically influential neighborhood that has been home to five Chicago mayors, including the current one, Richard M. Daley. The Bridgeporters never would have allowed it, and so the ballpark that sprang up across from old Comiskey was, in many ways, a tribute to the characteristics of its surroundings: small-minded, hostile and all about clout. That, in Chicago, is a true neighborhood park. Photo via statlerhotel's Flickr account. Next up: The Minnesota Twins' Hubert H. Humphrey Metrodome. Got any horrible experiences to share? Send them to craggs@deadspin.com.